A farm girl from Prunedale California, JoAnne Lake an insistent patient, forthright and wordy because she is one of five million people in America with bladder problems and wants to start a conversation. She likes to tell it like it is. The secret of her success is embracing the state of affairs with luminosity and honesty and taking the punch away. She does not want to be remembered in connection to the toilet yet she sees toileting dysfunction as the last frontier of subjects that needs to have a mature conversation. Her writings come from life experiences and emotions as a patient, mother, educator, and friend. After journaling her private thoughts and feelings, she started writing a highly successful blog in 2012 to educate and inspire others with bladder and bowel problems. This is her first book. 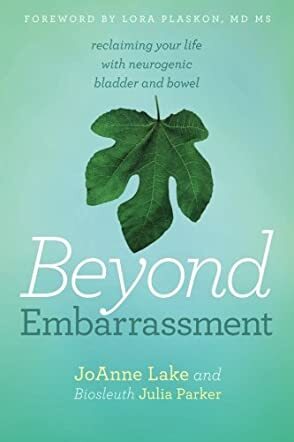 Beyond Embarrassment: Reclaiming Your Life with Neurogenic Bladder and Bowel by JoAnne Lake and 'bio-sleuth' Julia Parker is JoAnne’s honest and open story and her will to succeed in spite of having to face physical and medical challenges. JoAnne’s story will encourage medical practitioners to share this with their patients and increase the patients’ will to overcome the condition and lead a normal and successful life. The story is not only motivational to those with a neurogenic bowel and bladder, but for all those who are struggling with life’s hurdles. The book helps in giving confidence, empathy, and support to patients who are trying to overcome a very intimate health issue.